Inside this post we’re going to review the dramatic changes seen with Lucas Giolito’s arm action and how the smallest, teeniest tiniest adjustments are the ones that create the biggest changes. You’re going to discover a much deeper layer behind pitching mechanics and how the body and brain are one when it comes to making any sort of change that sticks. In fact… It’s going to force you to question everything you know about pitching mechanics. Why the kinetic chain starts with the brain, if you want permanent changes to stick. How weighted baseballs force the arm to take the path of least resistance. How the lower-half influences the upper-half for better or worse. Why The Arm is at the mercy of the hips. And a whole lot more. Ready? Just the other day I was watching the highlights of Lucas Giolito’s near no-hitter because he was one of many MLB pitchers who trained daily with The Core Velocity Belt. Disclaimer: I do not know Lucas, nor have I ever worked with him. But, I’ve got to say he definitely is a smart guy and surrounds himself with forward thinking people. BIG thanks to @lantzwheeler25 for hooking it up with the #corevelocitybelt 🔥 I’m very excited to be adding this to my offseason routine! Also thank you to my guy @ethankatz8 for introducing me to the product! Right away I noticed a dramatic change in his arm action. Lucas Giolito, 2018 vs 2019 overlay/Arm Action change. Instantly, it reminded me of another MLB pitcher Neil Ramirez, who did the same thing in less than 3 weeks back in 2014. In the video on the left he’s 93 in early June and 97 3 weeks later with a cleaned up arm action. Crazy thing is… This change occurred without even trying. It was natural. I started digging up info on Lucas and this was the first thing I read…. “Naturally from doing that, early in the offseason my arm action started to shorten up. It went from stab out, behind my back, long, bring it back up to a more compact just out of the glove, up and fire. Lucas attributed the change in arm action to his weighted ball throwing program, and it’s partly true. I’ve seen it myself and I think Kyle Boddy has done a wonderful job bringing weighted balls into the world of development. And you’ll notice in this video how Lucas has changed the position of his forearm at the starting position and the path at hand-break, which both can be attributed to weighted balls. Just like The Core Velocity Belt, a weighted ball is simply another tool which enhances a FEEL for the task. Heavier weighted balls force the arm to take a more efficient path. Strengthens the shoulder and elbow joints and tendons. But a weighted ball program by itself, won’t be enough to make changes like the ones I see with Giolito. I know there’s a lot of you out there that are going to say weighted baseballs are dangerous. So my advice to you is never pitch in the early morning when there’s dew on the field because you’re throwing a weighted ball. Where was I? Sorry, got off track. Oh yeah. Like most pitchers, coaches and observers it only makes sense to think arm action would change because of something you were doing with the arm, right? The kinetic chain starts with the brain. The arm is at the mercy of the hips. Most pitchers and coaches waist the majority of their training time focusing on the position of the arm with the use of pitching drills and connection balls. By doing so, they constantly find themselves picking up the fallen dominoes over and over because they never addressed the problematic domino causing the rest to fall. The biggest changes occur from the teeniest-tiniest adjustments. So, how did Lucas make these changes to transfer his kinetic energy more efficiently? He was over-analyzing every move he was making. He was guilty of over-thinking every position. His computer was running slower because he had way too many tabs open. “A lot of mental stuff,” Giolito said. “I did a – it’s called a neurofeedback program where basically they read your brain waves. You work to build better neural pathways. Everyone is different. Like I Said… The Kinetic Chain Starts With The Brain! It’s why it’s the first place we start inside my 3-Day Core Velocity Programs. The loudest performances are orchestrated by the quietest minds. To get the body to move faster, the mind must move slower. Breathing is the Invisible bridge between the mental and physical game. Hopefully, you’re starting to understand what I said earlier about the science of pitching mechanics being a dynamic, chaotic system where everything affects everything. And it all starts with the brain. If you’re having to think about every move you make, obviously you’re not going to move very efficiently. Fortunately, Lucas started there first instead of jumping straight into pitching mechanics and drills. Most of the “highlighted positions” pitching coaches strive for to increase velocity and improve pitching mechanics, are merely bi-products of efficient movement. Inefficient movement anywhere will affect the quality of movement everywhere! I heard Paul Nyman say this years ago..
Hunter Bledsoe calls this phenomenon, “Matching the hands and the feet”. We attempt to coach a rotational sport using linear cues! Most Mechanical Flaws are Man-Made! Here’s a few examples of both hitters and pitchers taking advantage of how the body naturally craves symmetry. Kershaw and Papelbon: Same thing seen here with 2 MLB elite. Notice how the front leg action mirrors the path of the arm leaving the glove with both. Why is this so important to athletes inside a rotational sport? By mirroring the opposite sides of the body, it keeps the middle in the middle. It maximizes the stretch reflex and fascial tissue to store up and release kinetic energy. Video 1: Position of forearm angle in the setup creating a more efficient path. Video 1 & 2: Hand break path matches front leg’s timing and path. Video 2/3: He went from an inefficient front-hip dominant action in 18 to a back-hip dominant action this year. Video 4: He maximizes the angle of the mound by “Riding the Slide” to connect his body and create a better angle to throw down hill with greater extension at release. He’s changed his lower-body patterning and timing to become back-hip dominant in 19 compared to an inefficient front-hip dominant action in 18′. Here’s a better view of what I’m referring too on the difference between a front-hip dominant lower-half versus a back-hip dominant action of the lower body. Isn’t it crazy how it works? Learn to control the center part of your body and suddenly everything looks different. Even the smallest rotary change in the middle of the body (pelvis/hips) will drastically impact the arm. The type of lower-half changes he’s made were of a product of learning to move through the middle of his body. To do so, you’ve got to begin by FEELing the movement and from there, challenge it. This level of change didn’t happen with pitching drills. Nope. Watch the bi-products of his delivery after making changes with the movement of his pelvis in the video below. Better direction to serve as axis of rotation. Corkscrews front hip increasing the efficiency of the follow-through. Do you know why it’s not typical to see most taller guys, especially a guy 6’6, to see this sort of efficiency with his pelvis and hips? Because he’s probably been told his entire life to stay tall. Throw down-hill. Whenever that’s the goal, you’re going to see pitchers with very passive lower-bodies and most FEEL as if they’re throwing the ball with all arm. Crazy to think Lucas got greater extension and more efficiency by throwing like a midget. Ever seen a short pitcher who doesn’t maximize the use of his legs? Because short pitchers are never instructed to stay tall so they naturally get more from their lower-half. Most mechanical flaws are Man-Made, the body would never organize itself in that manner had it not been confused. So, how did Lucas maximize his lower-half? For one, he spent time training with The Core Velocity Belt to increase core stability and better FEEL his lower-half working to enhance his FEEL for the lower-half and transfer the so called “muscle memory” to the mound. And pitchers who can’t FEEL their mechanics are constantly leaning on another’s opinion for advice. Only to be told by their next pitching coach to do something entirely different. Over-analyzing every move you make. Over-thinking every single thing you do. Without proprioception, coordination doesn’t exist. 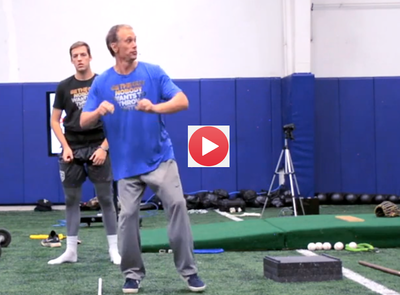 Because he increased his awareness of his hips, his coordination of movements inside the lower body began to sync up into his overall pitching motion. Here’s a video showing that in full effect. Become aware of his center, he took advantage of gravity and total body connection. He began moving his middle more efficiently, faster. Because he had better FEEl for his lower-half he mastered the subtle sub-movement required to put in motion, such as the corkscrew and riding the slide. “The results have been great. It feels better, I feel healthier. It’s a more clean action. I feel like I’m much more consistent getting on top of the ball, especially my fastball. In the end…Both pitchers paths to changes are very similar. Increasing the proprioception of his hips which led to more coordinated movements. Due to his increased motor control of his hips, he was able to Peer-Pressure his arm into believing it was running out of time. Finally, he learned to put it all together when Riding the slide (Mirroring his hips to the slope of the mound). And I had a pretty good idea, Lucas did the same… And I think I was right? Increased the FEEL for his hips by using The Core Velocity Belt which in turn helped him to move more efficiently through the middle of his body. And pretty much followed the same path Neil followed in 2014 when he saw changes. From there, the arm and body connected due to the enhanced mind-muscle connection allowing his body to move faster and more efficiently. And the best part about this story? He did all this without ever Over-Thinking or Over-Analyzing his pitching mechanics. Unfortunately, most pitchers and coaches never address the brain. Instead they go straight to the body and before you know it… We’ve got pitcher after pitcher Over-thinking and Over-analyzing every single move. The real key is learning how to put your pitching mechanics on auto-pilot and that’s exactly what Lucas Giolito did. Really appreciate you taking the time to breakdown how Luc made the changes this past offseason. Now I understand! You got it man… Love seeing you guys make these sort of changes and do so, by getting out of their own head. Love how much better he’s moving through the middle of the body to force “natural” changes. Glad to help anytime. Thank You for sharing this. This was very instructional. Thanks Ken… I appreciate you taking the time to comment. « What’s The #1 Thing Most High Velocity Pitchers Do?